Get your music, photos, and videos from your computer to your phone (and vice versa). 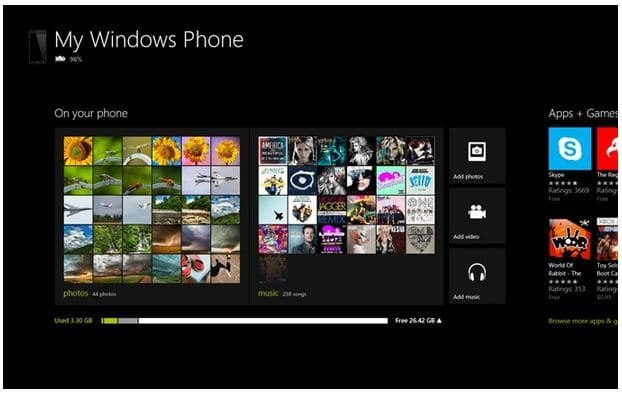 Quickly share things from your phone with Windows 8 apps (like Photos, or Search). You don’t even have to open the Windows Phone app to move things around. Automatically save photos and videos you take with your phone to your PC. See at a glance how much space you’re using for each type of content, so it’s easy to make sure you never run out of room on your phone. Get to WindowsPhone.com to download apps, learn more about your phone, or find it if it’s lost.